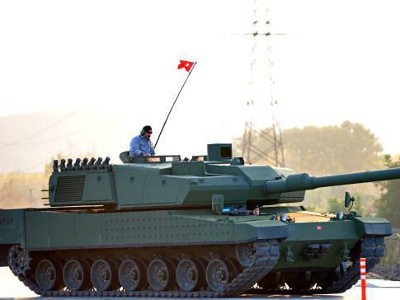 An Otokar Altay main battle tank. Turkish company Otokar is targeting growth in Africa, and is promoting its products at the Shield Africa defence exhibition in the Ivory Coast. “Africa is among our principal markets and we aim to increase our presence in the continent. This is our first attendance in Shield Africa exhibition and we believe it will be a good opportunity for us to reinforce our relationships in this sense,” said Serdar Görgüç, Otokar General Manager. He noted that Otokar has built 30 000 military vehicles, which are in service in 32 countries around the world, including in Africa, Asia, the Middle East, and Central Europe. Otokar designs and manufactures a wide range of tactical armoured vehicles including 4×4 Ural, Cobra, Cobra II, Kaya II, ISV, Arma 6×6 and Arma 8×8 vehicles as well as the Tulpar tracked armoured vehicle family and Altay main battle tank..
With the expansion of its vehicle family, Otokar turned its focus on turret and weapon station developments. With almost 30 years of knowledge and expertise in turret systems design and integration, Otokar developed MIZRAK, BOZOK, BASOK, UCOK and KESKIN remote controlled turrets ranging from 7.62 mm to 30 mm. Otokar has sold vehicles to a number of African countries, most recently Burkina Faso. It was revealed to be operating Cobra armoured vehicles in December last year. Algeria, Mauritania, Nigeria, Rwanda and Tunisia are amongst African Cobra operators – the type has found widespread acceptance by militaries around the world.